Carbon dioxide is not always the villain. It can actually be quite beneficial for companies like Houston-based Anadarko Petroleum Corporation, which is using the greenhouse gas for enhanced oil recovery (EOR), a process that involves injecting otherwise tapped-out wells with CO2 to produce additional oil. For more than 40 years, the Salt Creek field has been producing oil through waterflood recovery technology that utilizes pumping units, or pump jacks, to draw oil out of the ground. CO2 emissions that would normally be released into the atmosphere are captured, compressed, and purchased from a natural gas processing plant, then shipped via pipeline to oil fields. The CO2 is recycled over the lifetime of these EOR projects to continue generating production from these fields. CO2 has breathed new life into Anadarko's Salt Creek field, a site 45 miles north of Casper, Wyoming, that invokes the kind of nostalgia associated with boomtown times in the United States. 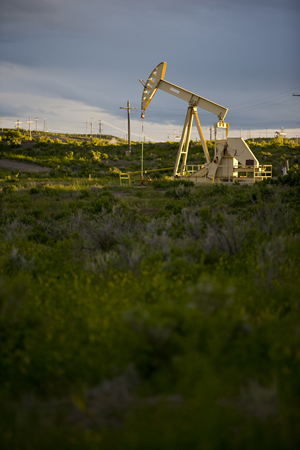 Oil was first struck at Salt Creek in the early 1900s, and at 45 square miles in size, it is one of the largest oil fields in the Rocky Mountains. With more than 4,000 wells, this rich swatch of Wyoming ground has yielded about 655 million barrels of oil in its tenure. Production by conventional drilling has dwindled, but Anadarko hopes to draw at least another 150 million barrels of oil out of the field by injecting CO2 into the ground. This pushes the oil toward previously drilled wells in the field that have been refurbished for production through EOR techniques. By using existing well bores, the company can increase production while minimizing surface disturbance. When Anadarko initiated its EOR program in 2003 at Salt Creek, the company built a 125-mile pipeline capable of transporting 250 cubic feet of CO2 per day from Bairoil, Wyoming, to the Salt Creek field. Anadarko expects to sequester about 700 billion cubic feet of CO2 over the lifetime of the Salt Creek project, reducing the state's overall CO2 emissions. "Our primary objective is to increase oil production from the field, which is extremely important at a time when our nation needs all forms of domestic energy resources-especially oil and natural gas, which will continue to make up the bulk of our energy supply for the foreseeable future," said Ken Michie, Anadarko's subsurface manager. "We are producing oil that's been trapped in a sandstone-type rock. As a benefit of our EOR operations, the Salt Creek field will be one of the largest CO2 oil recovery and geological sequestration projects of its kind in the world. We are currently using 125 million cubic feet of CO2 per day that would otherwise be vented into the atmosphere-that's equivalent to eliminating the emissions of more than half a million cars per year." While the concept of carbon sequestration for the sake of conservation is an emerging idea, the repurposing of CO2 for enhanced oil recovery has been in practice by the oil and natural gas industry for 35 years. With the evolution of related science and technology, EOR has become an increasingly efficient, safe, and practical investment. In the United States, there are more than 13,000 EOR wells and 3,500 miles of high-pressure CO2 pipelines, according to a 2007 report by the American Petroleum Institute (API). The report estimates that, through EOR projects, 600 million tons of CO2 have been injected into the ground to produce about 245,000 barrels of oil per day. The life cycle of a producing oil field, such as Salt Creek, includes several stages. Initially, oil flows naturally to the surface with existing reservoir pressure. As natural pressure drops, the reservoir is flooded with water to push out more oil. In the final stage, any remaining oil is recovered by CO2 injection, miscible natural gas injection, or steam recovery. "We expect CO2 injection to keep Salt Creek Reservoir in oil production for at least 30 more years," Michie said.